Lie face up on a bench. Your feet may be on the bench or flat on the floor, depending on what is most comfortable for you. Grip a set of dumbbells and raise them to arm's length above the chest. Make sure your palms face forward. Slowly lower the weight to the chest. Exhale as you raise the weight and inhale as the weight is lowered. Don't arch your lower back – this is bad for your spine. Start out light. It's better to tone your muscles with a weight that's a little light rather than something that's too heavy. 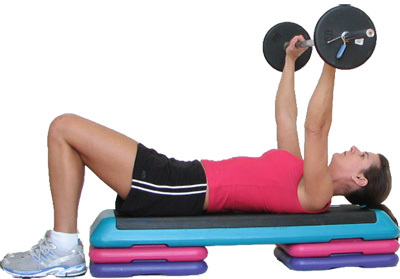 Every year, thousands of people injure themselves in the gym with too-heavy weights.